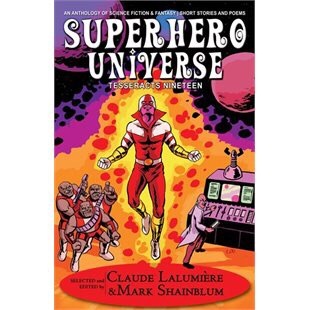 A review of Patrick T. Goddard’s “Diary of a Teenage Grizzly” in Tesseracts Nineteen: Superhero Universe” Edited by Mark Shainblum and Claude Lalumiere (Edge, 2016). In “Diary of a Teenage Grizzly”, Patrick T. Goddard brings together multiple different comic book and fan narratives. He addresses a letter to the editors of Tesseracts Nineteen: Superhero Universe in which he tells them that he uncovered a diary from his time as a teen superhero in the 1980s. He plays with the notion of the multiverse to write himself into a superhero story, creating an alternative history for himself in which his teenage years were a battle between his life as a teen and his life as a superhero. Goddard plays with the fan fiction narrative of the Mary Sue, in which the author inserts her/himself as a character into the story, but uses the comic book narrative and the format of a diary to play with the idea that this was an alternative history for himself. Despite being a superhero story, Goddard’s tale reveals some of the realities of teenage life including the complicated mix of feelings that get experienced in the high school setting. Goddard’s character/ self experiences clashes between different social groups, the pressure to fit in and conform, conflicts with personal needs versus the desires of parents, and the uncertainty that defines the teen experience. Writing his teenage self as a bear shape shifter whose emotions trigger him to change from human into grizzly bear reveal the way we portray teens as unstable, subject to emotion, and generally a danger when they become emotional, ascribing animalistic characteristics to them. Goddard invites us to imagine the life of the superhero child and the pressures that it places on their life in addition to the regular challenges of high school life. He explores the complications of hiding identity, celebrity culture around superheroism, and the challenge of defining one’s moral structure in a world that is divided into hero/villain. Marie-Lunie is a girl who has one eye in one world and one in another. Erika Holt’s teen fiction steam-punky supernatural story Just Dance explores a girl who has discovered that her father has been keeping research secrets. Marie-Lunie has one natural eye and one artificial one, made of a crimson glass orb she found on her father’s desk. The eye allows her to see into the spiritual world and opening her spiritual eye allows her to travel into the Otherrealm. Marie is an outsider, a social outcast from her school and escapes from the taunting of the other students into her own independent world. Her worldview is challenged when one of the popular girls comes to her house needing help finding her father and Marie has to lead her into a world of the supernatural in order to help a popular girl who treats her and her friends with disgust. Holt takes a ride into the outsider realm, a place of the Otherrealm where things can be seen that are ignored by the ‘normal’ parts of society, the popular people. It is only through a girl who is born with one eye missing who lives on the fringes that is able to see through the fictions of the world, and question society’s popular assumptions. Holt takes her readers on a quest through their own assumptions and their own limits, opening her teen readers to the idea that the popular and the unpopular aren’t really that different. When there are monsters in the world, are people really that different from each other? And, really, are the monsters so different after all? Holt’s Just Dance isn’t limited to a teen audience and any reader will enjoy her creative, comic exploration. To read more about Erika Holt, go to http://www.inkpunks.com/about/erika-holt/ . You can explore this story and others in Tesseracts Fifteen, available from Edge and Tesseracts Books at http://www.edgewebsite.com/books/tess15/t15-catalog.html.